Are you looking to add some color to your life? Ace produces foals with friendly and people oriented dispositions, their willingness to please attitude makes them very trainable. His offspring have true and correct conformation with the size and athletic ability to give them the versatility to go into any discipline. 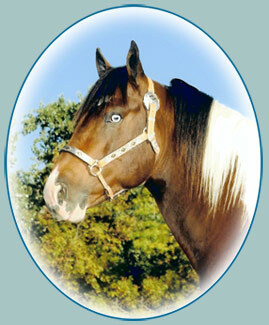 Ace is 15.3 hands and was tested homozygous for the tobiano and black gene. 6 panel N/N. Live cover only, multiple mare discount, LFG. Mare care is $6 /day dry $7/ day wet. Email us for more info on Exclusive Patch. SOLD Thanks Deb of ND; Cody is black and white homozygous for tobiano. Stands 14.3 hands tall. Nice quiet stallion, pasture or hand breeds. 6 Panel N/N. (Picture and pedigree under "Riding Horses" page) He is broke to ride but I have not rode him. Email us for more info on Codys Dancin Payne.